Carrots a are best grown from seed and are easy to grow if planted at the right time. Seed is best planted directly and they can be planted after the last frosts, in spring, as the weather warms up, however before it gets to hot. In a good soil, you will easily grow a crop, ready to harvest around 3 – 4 months after planting. You can plant a second crop in early summer as long as you have access to water over summer. You can grow carrots from seed collected yourself, you will need to let a few plants go to seed. Wait until the seed sets and then collect it in a paper bag for planting next season. 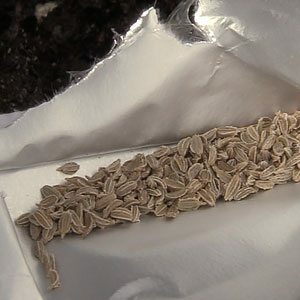 Carrot seeds are small however easy to plant. The best time to plant the seeds in colder climates is in spring, although you can sow from autumn to late winter in warmer areas. Prepare the soil well, dig it over, remove weeds and make the soil loose and friable by digging well rotted compost and a little aged cow manure. Do not add to much manure and fertiliser as this can lead to woody carrots. Preparing the seed for planting. You can simply plant the seed, however some growers use a few tricks to improve germination rates. Before you start to grow carrots from seed you can try soaking the seeds before planting to improve germination. Soak in warm water for 6-8 hours and then sow directly. Some growers freeze seeds for 3 weeks before planting to increase germination. The soil should be moist when you plant the seeds. You can make some drills in the soil with a rake, a stick or even your finger. They do not need to be deep. The carrot seeds are them sprinkled into the drill and lightly covered with soil. 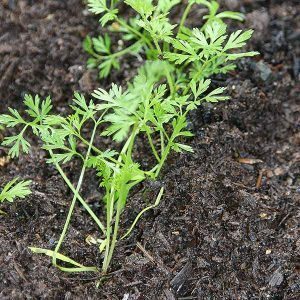 Thin seedlings, carrot seeds are very small and are often sown to thickly, so be prepared to thin them after germination. The seeds will take around 3 weeks to germinate. Water in well and keep moist until the seeds germinate. You can see when the carrots are ready to harvest, simply pull the foliage back and you will see the top of the carrots. A major factor to consider when growing carrots is not to over fertilise, and this includes digging in manure and compost. To much fertiliser, or organic material can cause forking in root vegetables. Grow carrots in soil that was manured the previous season and used for another crop. Why is it best to grow carrots from seed? Carrots do not like being transplanted, they tend to bolt and go to seed, rather than produce carrots. So don’t buy punnets of carrots, sow seeds for best results. Generally the carrots you can grow in the garden fall into two type, early crop and maincrop, and available in a number of colour varieties including red. Different varieties have different soil requirements. The long growing type really need deep soil, if you only have shallow soil, or wish to grow carrots in a container try the shorter types such the Chantenay varieties, these include Carcas, Carson, Royal Chantenay and the Supreme red cored Chantenay. Royal Chantenay – For containers this is the best we have grown. Topweight – Pest resistant, large carrots and good heavy cropper. Nantes – Very small core, juicy and crops in around 10 weeks. Deep Purple – This is purple all the way through, unlike others that are red on the outside and orange on the inside. Very nutty taste when sauteed in a little butter. Baby Pak – Very good baby or ‘finger’ carrot, 7 weeks to harvest. Very popular , and we think very tasty ‘Purple Carrots’ are actually close to the original carrot. The orange ones are the ‘new ones’. Purple varieties can reliably be grown from seed and are well worth a try in the home garden. These varieties go under a number of names, including Deep Purple, Purple Haze, Purple Dragon and Purple Rain, (some are hybrids) they all differ a little in actual colour so check them out before you order. Yellow varieties are also available.